2016 Topps Star Wars The Force Awakens Complete Set combines each of the base card sets specifically for The Force Awakens into one simple release. The online-only product features a factory format which includes all the cards from the three main Topps products that focus on Episode VII. Exclusive to Topps' online store, 2016 Topps Star Wars The Force Awakens Complete Set contains a total of 310 base cards. Collectors can find 110 cards from Journey to TFA, and 100 cards each from Series 1 and Series 2. The two short prints from Series 2 are not part of this release. Offering something to distinguish the cards from the pack-pulled base, all 310 cards showcase a special "Complete Set" foil stamp. Unlike many of the other factory sets from the card maker, 2016 Topps Star Wars The Force Awakens Complete Set does not include any added exclusives as part of the product. 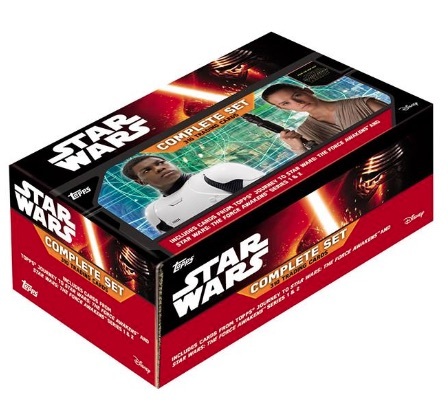 2016 Topps Star Wars The Force Awakens Complete Set is sold directly through the Topps site for $49.99 per box. 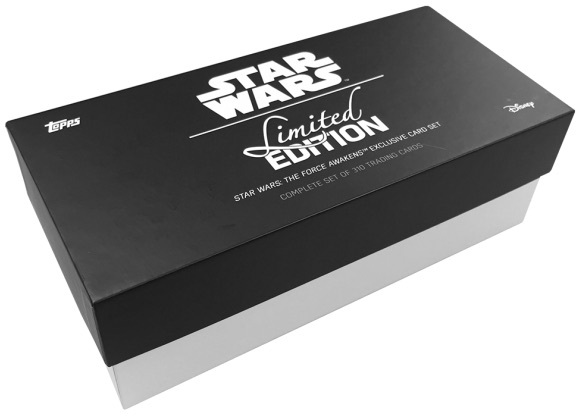 Topps also has a Limited Edition set that is capped at 1,000 box sets. These add a Limited Edition foil stamp and cost $99.99 through Topps. Topps Star Wars Force Awakens Series 2: Base set 100 cards! 45 The Rebels are found! 67 FN-2187, also known as Finn! Were any of the original base cards for any of the force awakens sets autographed? I have multiple 2015 series one base card #58, Poe’s x-wing fighter. I found one to have a stamp on the back marked 061/250. What makes this one more special than the other ones I have?